Amazon founder Jeff Bezos briefly overtook Bill Gates on Thursday to become the world's richest person, as his worth hit $91.4bn (£70bn). 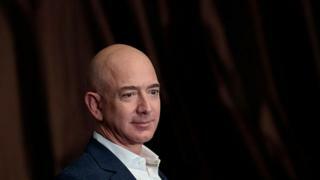 A sharp rise in Amazon shares meant Mr Bezos's wealth eclipsed that of the Microsoft co-founder for a time according to Forbes. But as Amazon shares fell back, Mr Gates regained the top spot. Recently soaring technology stocks have fuelled huge growth in the worth of entrepreneurs such as Mr Bezos and Facebook founder Mark Zuckerberg, 33, who is number five on Forbes's list. But the last person to steal the lead was Spanish fashion boss Amancio Ortega, founder of Zara's owner Inditex. He was the world's richest man for two days last September. Amazon's current share price puts Mr Bezos only marginally behind Mr Gates. Earlier this year Mr Bezos paid $23m for an old textile museum in Washington DC. Once it's converted to a family home, the Bezos family will be near neighbours in the exclusive neighbourhood with the Obamas, as well as Ivanka Trump and her husband Jared Kushner. At least that's what the Washington Post reported, a reliable source presumably since Mr Bezos bought the paper in 2013 with $250m of his own money. The Bezos family also has homes in Seattle and Beverly Hills, but expenditure on property pales into insignificance compared to Mr Bezos's foremost passion: rocket science. It was Mr Bezos's idea to start giving away bananas to passers-by in Amazon's home town of Seattle - a generous gesture, especially since about 4,500 people reportedly take up the offer every day. But when it comes to philanthropy that is still peanuts compared to his peers. While he and his family have given millions to good causes, Mr Bezos has been criticised for not doing enough. He doesn't splash out for non-profits on the scale that Bill Gates, Facebook founder Mark Zuckerberg and others do, and is yet to join the 169 of his wealthy peers who have pledged to give away half their personal fortune. He tweeted a request for suggestions as to how he could give money away that would have an impact "here and now" - a kind of next-day-delivery philanthropy. It remains to be seen which proposals - ranging from libraries to tech talent in Africa - have caught his imagination. Good causes are already very much the domain of Jeff's brother Mark Bezos. He switched from a career in advertising to work for the New York based anti-poverty organisation Robin Hood. In a 2011 TED talk Mark Bezos relates how, attending his first fire as a volunteer, he was keen to show what he was made of. But someone else was asked to brave the smouldering building to rescue the owner's puppy. "At that age I'd take any excuse to make estimates and do minor arithmetic. I'd calculate our gas mileage, I'd figure out useless statistics on things like grocery spending," he told Princeton's class of 2010. For example he whiled away some time calculating that smoking would be likely to take nine years off his grandmother's life. "I expected to be awarded for my cleverness and my arithmetic skills," he said. But his grandmother burst into tears. Grandfather talked him through how sometimes "it's harder to be kind than clever". Early on he was already imagining space hotels, amusement parks, and cities orbiting the Earth. And Mr Bezos's dreams are getting bigger. "I want millions of people living and working in space. I want us to be a space-faring civilisation," he told Geekwire last year. Mr Bezos does plan to go into space himself too, of course - once Blue Origin is ready to take him. But as Blue Origin's slogan says: Gradatim Ferociter, (apparently Latin for "Step by Step, Ferociously") maybe he's not rushing things. 2015 New York Times publishes report painting a critical picture of working conditions at Amazon, which Mr Bezos says he "doesn't recognise"
2017 Manchester By The Sea, a feature produced by Amazon Studios, wins two Oscars including best actor for Casey Affleck, while the studio also picks up the Best Foreign Language gong for The Salesman.